Colour in an ANZAC soldier, a sprig of rosemary, or a picture of Gallipoli hero John Simpson and his donkey - our new collection of Anzac Day colouring pages. The soldiers of the Australia and New Zealand Army Corps - ANZACs for short - were well known for their slouch caps and jaunty attitudes! 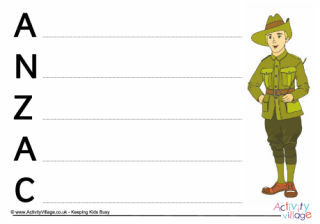 Here's a colouring page of an ANZAC soldier to print.